Now, I don’t have a problem with pre-mades (teams who play together online). That’s a great thing in fact as long as the other side understands that. What I would like to see is something like the above. Where it looks at the player’s record and sees how many games this person has had the other people on that team in their game. Just information so people can make choices. What a great idea! Im always looking to find people to play with that have about the same experience as my team. I usually have to put in the tittle that we are looking for other premades to fight but this makes it easier! i like this, but it would also be nice to have a shuffle teams option, then the ability for teams to disguise themselves as random players (what generally tends to happen) could be partially negated. What I would like to see is something like the above. Brad - is that something that can be put in by SD or is GPG required for a change to the lobby? The connection dialog is Stardock so we can do that. That part is the overlay, Pacov. I believe its something Stardock can do. The intent is good, and I'm glad you're considering getting moving in that direction. First, forget about experience rating. I know you've spend a lot of work on it, but the sad truth is it's a complete failure. I hear you've based the rating system on the chess ELO rating, well chess and DG are two totally different beasts. One is a 1v1 game with slow progression, the other is a team game with fast progression (you can become a decent DG player in two week's time, with chess, try years instead). Bottom line is the experience rating doesn't tell anything about a player's skill : you can have 1100 (good rating) and be a hopeless newb, you can have 100 (abysmal rating) and be a very good player. Rating players ina game like DG is a very tough problem, and I'm sorry I can only tell you've failed at it without having a suggestion for a better system. But I do have a suggestion as far as the displayed information : total number of games - win % - win % over the last 20 games. Not ideal, but a lot more useful. First, can the connection overlay get data from the game lobby ? Because if you can't tell on which team the player is, the idea is stillborn. Second, well, that's your topic title : what algorithm shall be used ? What part of the game history shall be considered ? Total games played ? Last 30 days ? Last week ? I believe that to get a meaningful value for that "team %" would be incredibly difficult. So my suggestion would be to change the display : on line per player, with additional information for players on the same team : total number of games played on the same team, number of games played on the same team out of the last 20 (if total number of games played > 20). Some redundant information, no information about the team as a whole (only about players' familiarity with one another), but I believe it would be better than trying to sum up everything in one figure. I like the % on this team idea. I tend to shy away from DG online because I am a casual gamer and all the stressing this communtity does over pre-mades has me reluctant. I would definitely join the online games if I could tell at a glance that the players in this game are pre-mades and that game are not. I only think it's hard to implement and prone to "cheating". There's always a way to "game the system", as you can see with the current disconnect/desync exploit. To me, the easiest option to keep premades and PuGs apart would be a simple "shuffle players" option which can be checked when hosting a game. All players will be assigned to a random team after the game starts, so the team in the game lobby does not count. Premades would simply not join such games because they would risk playing against each other. Moreover, the host can also not influence the strength of his team by kicking people with low stats, which happens quite often. All players will be assigned to a random team after the game starts, so the team in the game lobby does not count. I don't think this is a good idea... when I choose a specific character, its typically to compliment the members of my team (if I'm pugging or in a premade). This would take the strategic decision out of the equation and I'd be more likely to pick my strongest DG. That said, I'd play in a game like that from time to time for the same reasons I'd play in a random only game. I just don't think its a good solution to the whole premade/pug deal, BUT it DOES solve the problem. Regarding adding additional stats to the lobby - I'm all for that, but I'm thinking more along the lines of providing various stats about a player so those of us who check stats from time to time won't need to go to a separate site to get the info. All I'd need to see would be games played, rank, and win/loss ratio. I'm thinking in programming terms now regarding the premade notification system you are talking about. The most detailed method would have to show a character by character breakdown of how often individuals play together. In your example above, you'd need 3 entries for each player... so next to froboy's name, you'd see the "on this team" column populated with MR_Wizard (10%), Gank (5%), Amazing (1%) for example. You'd repeat this logic for each player in the game. Then, at a glance I'd know that wiz and Frog have played at least a little bit together, but I'd really need to see the number of total games played to have some idea what 10% means. Also, if would have to update on the fly as teams change (I'm not sure how you'd handle that). I'm all for something like this. So - there's my suggestion - include total games played, rank, win/loss ratio, and a Play Together column that uses the logic I describe above. I have to agree, I have seen a number of incidents where ELO has been wrong in demigod. The above seems better. I tend to agree, considering people who have never won a game are ranked higher than me, I honestly don't care about their experience rating. Agreed, a Win/Loss Ratio is where I look when gauging a player. If it's 1:1 or higher, I'm happy. I agree with not using experience as a measurement of talent or ranking. It is the most meaningless statistic I've ever seen in any game. As others have suggested, use the win-loss stat. I would also like to see an "average favor points per game" statistic for each player, since that's a truer measurement of individual talent. Win-loss records only reveal how often you were on a winning/losing team, which is not necessarily reflective of individual talent. That is, I am more impressed by the player who scored 100 favor but whose team lost the match than the dude who earned only the minimum 75 favor for winning the match. So, take total favor points earned and divide by total games played (each of these figures is already part of each player's online record). On the issue of premades, I think that Brad's suggestion about showing stats on how often people have played together is a good one. However, like others, I would also like to see a random-teams options that shuffles teams at game launch. That should solve the issue of premade teams being in a game unannounced. Those who don't want to be in random games or might fear that two UBs might randomly end up on the same team would still have the option of playing a regular custom game without the "shuffle" option. I think the best to offer wins/losses instead of a rating. Not sure where to put it, by the ping would not be bad. I hope thought that that diesnt ruin it for some people like myself. I am a casual player, but I am average. I work very well with good player. But i am a public player. Im not into clans/team and whatnot. As a result things get interesting and even thought I am a decent player I have a losing record... Hopefully people relize that a lager number of games = exp. I agree that the experience rating is pretty worthless the way it is set up. Unless you have a very high win percentage the experience rating penalizes you for playing more. Ironic then that it is called experience. Using favor as a rating is not a good idea though because the ability to aquire favor is not balanced among the demigods. 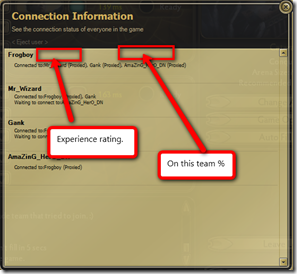 I do not think people should be penalized in the rating system if they play a support role. Awesome base concept. Rating may need tweaking, but % with team is great (perhaps list the # of games played next to the percentage as well) and some kind of skill indication to go along with that should solve most of the problem. Using favor as a rating is not a good idea though because the ability to aquire favor is not balanced among the demigods. I do not think people should be penalized in the rating system if they play a support role. I see your point, and I am very sympathetic to this view. I play QoT a lot, so I know all about the tradeoff between favor points and playing a support role. Still, the favor-point average would be one of a number of displayed ways of judging a player's experience and skill, along with wins/losses data, premade stats, etc. And I think that you have to judge apples vs. apples (that is, you would expect a decent UB player to have more average favor than a merely decent QoT or Rook). Overall, I think that the favor-point average could be helpful in sorting out how teams are matched in the lobby. For example, if you have an Erebus player with a 50% win percentage who averages 105 favor per game and another Erebus player with a 75% win percentage who only averages 65 favor points per game, whose the more solid Erebus player (as opposed to the one who happens to land on a winning team more often)? It sounds like SD are trying to take some initiative here (and help out GPG) by incorpoating this info in the connection dialog. A clever idea, and I think it would work fine since this info is easily available in the game lobby. And, really, if all we got (for now) was total games played and win/loss ratio, I think that would make a huge difference. "Noob-only" games could actually be noob-only. Etc. And, really, if all we got (for now) was total games played and win/loss ratio, I think that would make a huge difference. Experience as a concept is much, much better than win/loss ratios. It's the people who are going for perfect records and ridiculous win streaks that are the main problem right now, you would only make it worse. Experience just needs to start at zero and should never be able to drop below zero. That would be a major improvement. Also you need to just literally gain zero exp when fighting people with around 1k less exp than you. I think the issue is the figures for the win/loss exp gains, personally. In order to break even against a higher ranked opponent, the ratio is something like 10 kills for every one death. Thus, the requirements to achieve higher ranks are basically to absolutely, no questions asked dominate your opponents or run away unless the fight is so heavily stacked in your favour that you can't possibly lose. I don't think it's a realistic representation of how this game plays out, based on my experience anyway. Favour points accumulate much faster through winning, but still accumulate over time. They seem to be a very good indicator of experience. If only you take into account the amount of favour generated only in mp games, as well as the TOTAL amount, not just leftover. If i saw someone that had played say 10 games but had 2k favour, id know that they would be very good. If i saw someone with say 50 games but only 2k favour, then much less of an understandable experience. I played online chess before, but to challenge a player you saw exactly what the ranking outcome of win loss or draw would be. Could this be seen pre-match? The outcomes of a change in ladder rank for the individual per the outcome of win/loss? I believe that the best option for experience would be to use a currency easily understood and unique to the demigod franchise : favour. How about 3 options for pregame recognition : favour points accrued, gameswon/played overall (pure number)and (only in ladder based games maybe? ) ladder rank. Favour point are always abreivated, ladder position never. I should probably read the whole thread next time. I agree with Wyatan's and partially The_hunger's ideas (except showng avg. favor points). Ladder rank doesn't mean anything as well as favor points. Playing support or mainly map control role means you'll get least favor, nevertheless your contribution to team can be the biggest.